Hey, this is neat: G. Edward Griffin gave SPUD & HARRY a plug in this weeks edition of Unfiltered News! To anyone from Freedom Force International that has clicked on over, I’d like to take this moment to say “hi”. I just found out now. Click here for the full video. The next time life gives you a beat down, repeat the above as a mantra. See if it puts your mind in a better place to deal with things. It worked for me. Blair tells me that the FanExpo this year was another success! Even with only one man holding the booth, he managed to sell enough comics to cover all expenses, which is always the goal with these things. He even reported that there were some SPY GUY fans that came looking to complete their collections! Which is exactly the sort of thing any comic creator likes to hear. It somehow makes it all worth while. Hey, I finally figured out how to get a transparency channel in the Ultraist Studios favicon.ico by using this plug-in for photoshop. Neat! Been wanting to do that for ages. In other web browsing, I saw this variant cover over at Newsarama. Click on over and check out the comments below the main article. They’re interesting, and reveal a lot about the general populace opinion on art vs. politics. Especially interesting as comics originated primarily as political satire. Personally? I think all art should be used as a means of expression. As a matter of fact, it was the Savage Dragon vs. George W. Bush that got me reading The Savage Dragon again. 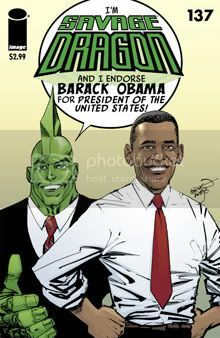 So if The Savage Dragon endorses Obama for President, then all the power to Erik Larsen for putting that on the cover. As you can see below, SPY GUY does NOT. We at Ultraist Studios do not fall for the false left-right paradigm. Mark Oakley explained it well over at I Box Publishing. Which is about the nicest thing one artist could say to another. 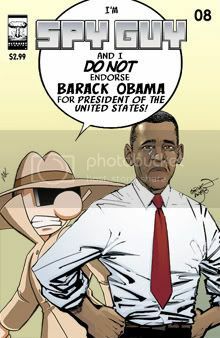 I was going to save this for a future letters column, but since SPY GUY #1 isn’t going to have one… well… there you go. And who knows, maybe I’ll still find a place for it in SPY GUY #2. Mark also posted a link to Zeitgeist The Movie; the same film that Matt Campbell recommended I watch a few months back. Thought the film was well done enough to purchase a copy from the film maker, however I just finished watching The Esoteric Agenda, and I think this film tops it. It’s a great 101 crash course in all the things I’ve been studying over the past few years, and even includes some new thinking I haven’t even encountered before in the final segment. Well worth a watch. Was hoping to get more pencils done on page 14 of Spy Guy #1. That didn’t happen. 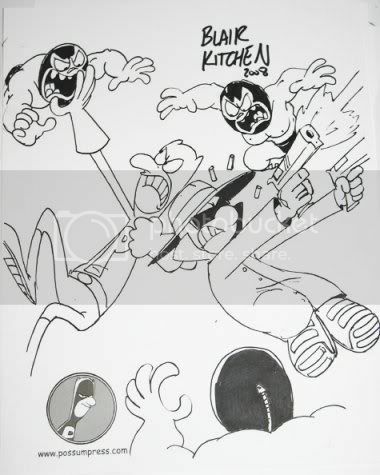 However I did manage to pencil some thumbnails for page 9 of Spy Guy #3. Man, I am just bursting at the seams with anticipation to get this next comic done. Hopefully life will start to calm down enough soon to give me some room to ink. This Blog Journal entry was brought to you today by the Ultraist Studios Portable Workstation and GO Transit.